Efficiency is a way of life for Joachim H. Ihrcke .The 61-year-old managing director of Droege & Co. Singapore Pte Ltd, part of a $150-million leading German management consulting company, spends most of his time helping German multinational corporations, which expand into the Asian region, and local companies to restructure, streamline and improve their operations.An electrical engineer by qualification, Ihrcke has more than 20 years of experience in management consulting and runs the Asian offices of the group in Beijing, Shanghai, Singapore and Mumbai. 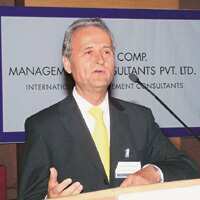 Droege, whose clients include Siemens Ltd, Dunlop, DaimlerChrysler, BMW, Volkswagen Singapore, Nestle Singapore and DMG, recently set up shop in Mumbai and is working on restructuring exercises with several Indian firms. The different factors that influence changes include customers, competition, regulation, technology, innovation and the need to be more efficient and reduce costs. In most cases, these are all interlinked in one way or the other. The benchmark for all this is the bottom line. Hence, in most cases, it is financial considerations or the ability to remain competitive with adequate returns that are most important for a company. Fix it only when it’s broke. Are companies far-sighted enough to take preventive measures or do they act only when revenues start dipping? In many cases, most companies look at preventive or growth strategies only when revenues slow down or they are at the bottom of the particular benchmark of the industry. In a growth market like India and China, you are growing at a phenomenal rate. Who cares if there are flaws in the way you operate? You are running at breakneck speeds and achieving profitability and big gains. Companies growing like this tend to become fat and inefficient. Most often, their processes and systems meant for sustaining growth are not put in place in a planned manner, but to cater to a need of that particular hour. Hence, this is not an organization that is built for the future. While the management, more often than not, fails to see the need for efficiencies, these are rudely brought to the front when growth slows down. But, by then, the system and processes are already in place and are difficult to change. Unless the management feels the need for change, we cannot go in, and if they feel they are able to cope, there is very little we can do for them. So, it fully depends on the vision and how a company’s management looks at the future. Even in this fast-growing market, many Indian companies see the need for reinvention to be able to grow well. Is the need to restructure an emerging market phenomenon? The need to restructure can be in any market, and the reasons behind each type are different. In the emerging markets, it could well be for growth reasons, to meet growing demand and new competition, evolution of systems like infrastructure, etc. In stable or negative growth market scenarios, it would be the need to stay afloat, reduce fixed costs and increase profitability or exit because there is no longer a viable growth market. So, it is not a phenomenon limited to any particular market. Is restructuring an ongoing process, or do you do it when it’s required? Restructuring is a process that any good company has to revisit over and over again, within a decent time interval—changes in the environment, developments in the market, evolving inputs and outputs, use of new technologies, etc., will mean efficiency enhancements are needed to stay profitable and compete. What kind of problems do companies come to you with? Are problems similar or different with different geographies? As discussed, it is not a single industry but across industries—from manufacturing to services—and across markets, with the evolution and life cycles. Problems could be similar but end solutions could differ, depending on the local conditions. For instance, to reduce costs, we could cut sales force for a company in Europe and invest in its enterprise resource planning system, linked to its retailer in real time. In India, with a cheaper sales force and inventory numbers at the retailer’s fingertips, suggesting a similar solution would be a bullet in the head for our client, and for us, too. Are there sectors which require more restructuring exercises than others or is it across the board geographies? Not really, it would be across the board, but there could be cycles due to new market forces, or the removal or introduction of some barrier. The restructuring might come in waves, at a given time, for some industries. For instance, in the banking sector, the outsourcing phenomenon has brought in changes in the way a service is provided. Hence, the sector needed to restructure itself as it evolved and this became a wave as others became more efficient and those left behind had to do it. Another example is IT services. From Y2K to current outsourcing, the sector required a lot of changes and restructuring in the way services are provided to the way they are used by the customer. So, it is not a phenomenon that is restricted only to a manufacturing company or a service company. It is across the board.